Jonathan Engineered Solutions is an ISO 9001 & AS 9100 certified manufacturer of high-quality aluminum ruggedized slides. 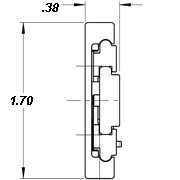 The 515QD series aluminum slide is a solid bearing slide, or non-ball bearing slide. This series is an alternative to use when ball bearing slides are not recommended or when a potential issue could arise from loose ball bearings typically caused from mis-alignment during re-assembly procedures. The 515QD slide is a 3 section slide, .38" wide x 1.70" tall. The 515QD has a load rating of up to 135 lbs. and is manufactured using a high strength aluminum alloy with MIL-A-8625A, Type II, Class 1 finishes. To ease the slides motion, the intermediate member is additionally coated with a durable dry film lubricant. Optional finishes and customizations are available. The slide locks open and is provided with a quick disconnect feature. Additionally, the chassis section or inner members are interchangeable with one another. This slide can be hard mounted directly to cabinets or when using Jonathan accessory brackets, slide can be positively mounted to electronic rack structures. The majority of Jonathan aluminum slides are custom engineered for specific applications. Jonathan also carries a broad line of standard aluminum ball bearing slides, available in various lengths, travels, features, functionality, and more. With an accumulated mechanical engineering knowledge base directly relating to aluminum slides, custom manufacturing capabilities, and a global footprint, Jonathan Engineered Solutions is the ideal source for all of your aluminum slide requirements. Travel: Full Travel 10" to 30"
Load Rating: Up to 135 lbs.